No Deje Que Esto Suceda. Esterilice a sus mascotas ("Don't let this happen: Sterilize your pets")... Thanks to ISAR, residents of two Fort Myers neighborhoods - Tropic Avenue and Kennesaw Street, which have a large percentage of Spanish speakers - are now being reminded, every day and in Spanish, of the stark facts of pet overpopulation and how they can combat this continuing evil. "No Deje Que Esto Suceda. Esterilice a sus mascotas" ("Don't let this happen: Sterilize your pets") Thanks to ISAR, residents of two Fort Myers neighborhoods - Tropic Avenue and Kennesaw Street, which have a large percentage of Spanish speakers - are now being reminded, every day and in Spanish, of the stark fact of pet overpopulation and how they can combat this continuing evil. At the beginning of January, two billboards with arresting images of multiple cats and dogs, the above message in Spanish and ISAR's phone number were posted on these busy Florida thoroughfares. Viewed daily by thousands of motorists, residents, visitors and owners of companion animals, the Spanish language billboards are part of ISAR's Spanish Language Spay/Neuter Program that concentrates on areas with influential numbers of Spanish-speakers. The billboards in Fort Myers are the first of the Spanish Language Spay/Neuter Program. They expand the overall program that, in 2016, saw more than 80 visually striking billboards installed along busy highways throughout29U.S. states, Canada and Ireland. 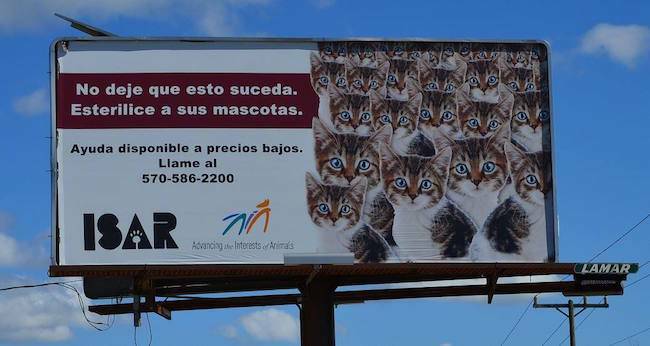 In 2017, ISAR hopes to post as many Spanish Language Spay/Neuter billboards as possible in areas around the U.S. that offer low-cost spay/neuter programs. These are a powerful weapon in the fight against dog and cat overpopulation. Partnering with Advancing the Interests of Animals, ISAR is targeting the millions of individuals and families throughout the U.S. who own unspayed or un-neutered dogs and cats. Educating these groups with eye-catching Spanish language billboards is an ISAR 2017 priority. In Lee County, where Fort Myers is located, 18 percent of the population speaks Spanish, but the impact of Spanish language billboards becomes clear as 86 percent of Hispanics in the Naples-Fort Myers market speak Spanish at home. Advertising to them in Spanish is 55 percent more effective, and 4.4 times more persuasive than English, according to The Pew Hispanic Center. If you live in Los Angeles, be sure to drive by ISAR's Spanish-language Spay/Neuter billboards that, as of February 13, will be featured at the intersection of Beverly Boulevard and Atlantic Boulevardand on Slauson Avenue in the Holmes Avenue neighborhood. North of L.A., in Fresno, a Spanish language billboard will go up on February 13 in the vicinity of East Kings Canyon Road and South Dearing Avenue with another one posted onGrant Avenue. The latter will be visible in a neighborhood where 75 percent of the residents identify their ethnicity or ancestry as Mexican and more than 50 percent of households speak Spanish. And stay tuned, as ISAR makes its mark with Spanish language billboards in Philadelphia this spring. The Spanish Language Spay/Neuter Program is multifaceted: ISAR's Public Service Announcements championing the fight against pet overpopulation are currently being rewritten and translated into Spanish. These will be distributed to hundreds of Spanish-speaking radio stations throughout Arizona, California, Colorado, Florida, New Mexico and Texas. In addition, ISAR is translating its model mandatory spay/neuter and related statutes into Spanish so that individuals and organizations advocating animal protection in Spanish-speaking countries abroad may use them as a basis for proposing legislation. So as ISAR embarks on another year dedicated to using education and law to advance animal rights, a heartfelt Feliz año nuevo and Happy New Year to our supporters and those working to make dog and cat overpopulation a distant memory.